Latin America’s corporations are accessing both domestic and international debt capital markets as never before, and investors are happy to fund growth in the region. Last year was a significant one throughout Latin America for local and international debt markets, with record numbers of deals at record sizes. Unlike previous years, in which the local markets complemented the international ones but were not fully fledged markets themselves, this past year saw domestic issuance throughout the year in both Mexico and Brazil. In addition, other leading Latin American markets, such as Chile, began to see some local issuance as well. The level of activity was unprecedented. With strong growth expected to continue throughout the region this year, companies are looking to the capital markets to fund growth, both at home and abroad. 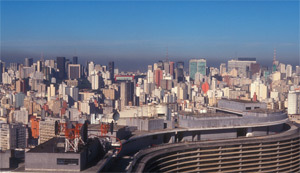 Companies in most major Latin American markets, including Colombia, Peru, Brazil, Chile and Mexico, will continue to have growing capital expenditure and acquisition funding needs in 2011, and they are increasingly turning to both the local and international debt capital markets for financing. In Brazil one thing that is driving issuance is a reduction in government support through the development bank BNDES, which has traditionally provided a great deal of debt funding to Brazilian companies. Although the state-owned development bank is still providing long-dated financing, it is increasing the all-in cost of transactions. As a result, companies are looking to repay loans through the local debt markets or are replacing BNDES loans with international capital market instruments. Infrastructure finance has driven and will continue to drive Latin American corporations into the international capital markets. With rapidly growing energy and natural resource exports, fueled in large part by resource-hungry China, countries throughout the region are planning huge investments in new projects in these sectors. 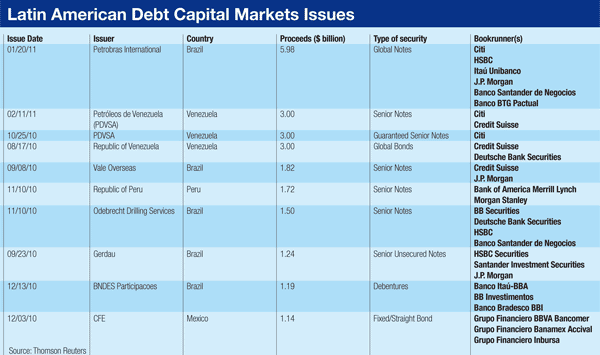 Latin America’s energy, oil and gas companies are tapping the debt capital markets for funding. Venezuela’s state-owned oil company, Petróleos de Venezuela, for example, launched a $3 billion bond sale in October last year through bookrunner Citigroup, and an additional $3 billion sale in February this year through Citi and Credit Suisse. Brazilian oil and gas firm Odebrecht Drilling Services also came to market, with a jumbo Eurobond. Odebrecht issued $1.5 billion in 10-year senior notes in November through bookrunners Santander, HSBC, Deutsche Bank and BB Securities at a price of 370 basis points over Treasuries. Additionally, substantial investments are needed in roads and other public infrastructure across the region. For example, in Brazil significant financing will be required for projects related to the Fifa World Cup in 2014 and the 2016 Summer Olympics in Rio de Janeiro. As well as building new projects, the country is planning to invest heavily in renovating and upgrading roads and tunnels that have seen little investment in the past 20 years. Local markets do still have significant limitations in terms of what the investor base is allowed to, able to or wants to invest in. Governments are working to open domestic markets up more to international investors, but it is a slow process. Ultimately, for international investors, investing in emerging-market domestic debt does present some difficulties, such as the lack of liquidity and the inability to clear local-currency bonds through the Depository Trust Company (DTC) or other clearing houses. For those companies that want to issue debt in their local currency but access a broader range of investors, global depositary notes (GDNs) are starting to offer a viable alternative. 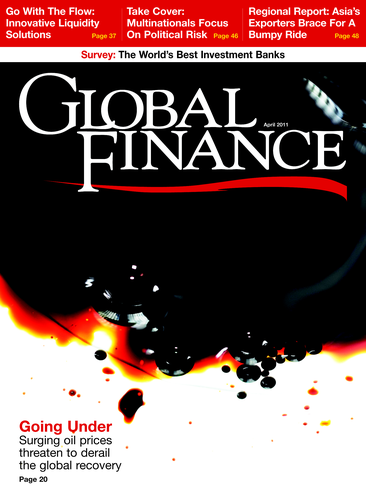 GDNs are effectively the debt equivalent of global or American depositary receipts. They offer the same terms as the associated local currency-denominated bonds, but they are traded on the open market, and they settle and pay interest in US dollars. 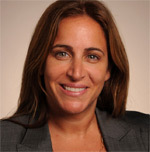 A few international banks, including Citi, Morgan Stanley and Bank of America Merrill Lynch, are promoting the product. They are of growing interest both to Latin American sovereigns and companies in the region. The Republic of Peru, for example, has been a front-runner in the use of GDNs, launching a series of GDN debt tranches with varying maturities going out as far as 40 years. Notes Marc Rossell, a partner at law firm Chadbourne & Parke: “It allows US investors to buy a dollar-denominated instrument based on local currency debt.” This gets around both the DTC clearing issue and, to some extent, the lack of a secondary market for local debt in most Latin American countries. In the GDN structure, local-currency bonds are issued in the domestic market and a depositary bank holds a tranche in a custody account against the issue of dollar-denominated GDNs. Local-currency interest is paid into the custody account and is then paid out in US dollars by the depositary bank to GDN holders. For companies, it provides a way to access a broader investor base without the difficulties of servicing dollar-denominated debt and the associated currency mismatch.